Where can I find my Model #? View the Video link for troubleshooting steps. 1. Turn energy saving switches to OFF. 2. Unplug power cord from wall outlet. 4. Move appliance away from wall to gain access to the back. 5. Remove remaining water from reservoirs by dispensing from the hot and cold taps into a pitcher or bucket. 6. Remove the cap from a spare empty 5 gallon bottle. Pour the bleach (2 tbsp.) or vinegar (2 cups) and hot tap water (2 Gallons) into the empty bottle. 7. Apply the cleaning bottle to the dispenser. 8. Allow the cleaning solution to fill the reservoirs. 9. Wait 10 minutes then drain the water from the reservoirs as described in step 5. 10. Rinse the bottle and fill with only hot tap water and apply it to the dispenser. 11. Place a two gallon bucket in the back of the appliance and remove the drain plug, while also flushing water through the taps (step 5). 12. Replace the silicon plug and drain cap. 13. Return the unit to its location, install a fresh water bottle, plug the power cord into the grounded wall outlet and turn the energy saving switch ON. 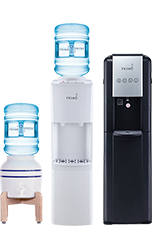 Primo® Water bottles are designed to a standard specification and should fit most water dispensers. Click here to shop for Primo® Water dispensers. According to the CBWA, bottled water has no expiration date. 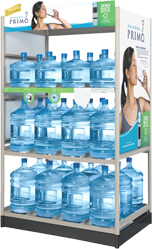 Primo® Water can be stored indefinitely as long as the bottles are kept in a cool location and out of direct sunlight. In Canada, some retail stores that sell Primo may offer a deposit program for the bottle. Check with the store for further details. Yes. Primo® Self-Service Refill bottles are BPA-free. Yes. Primo's filtration process features activated carbon filtration and a reverse osmosis membrane to eliminate chlorine. 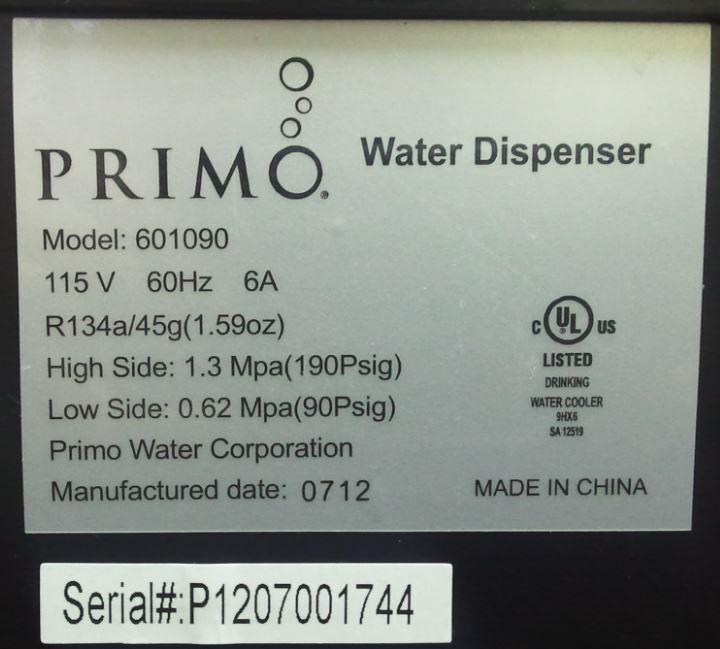 Can I use the Primo® Water Refill station if a “boil alert” has been issued? Your safety is our top priority at Primo. Though our systems are robust enough to remove contaminants, we shut down the system to ensure the safety of our customers. Once the boil alert has been lifted, our refill stations will be fitted with new filters and membranes in addition to being completely sanitized. Water samples are then submitted to an independent lab for testing to ensure Primo® Water meets safety and quality specifications. The refill stations will then become available for use once the “all clear” is given after lab tests and authorization is provided. The Item number for both Top Loading and Bottom Loading Water Dispensers will be located on the back of the unit as pictured.